It was 1957. Ike was in the White House, poodle-skirts were the craze, Elvis was shaking up audiences, and gas prices were at an all-time high of 24 cents a gallon. And in the tiny coastal Maine village of Round Pond, George Masters and his wife Edith, were doing their best to raise their family. George, a skilled machinist, saw an opportunity to start his own business. He hired three employees, obtained an abandoned schoolhouse and set up his own machine shop. Masters Machine Company was born. Throughout its history the company saw lean years as well as prosperous ones but George was always one to persevere. His attitude was that no matter what they went through, they “would always learn from it.” And learn they did! He took the knowledge they acquired and used it to do things a little better, a little faster than the time before. Masters gave their customers the parts they needed, when they needed them, and at a fair price. It wasn’t long before the customers kept coming back. In fact, now fifty years later, they still maintain relationships with most of their original accounts. Such a testimony speaks volumes in today’s competitive market. Masters Machine Company has expanded several times and the workforce has grown from 4 individuals to well over 100 employees. They have always stressed that their most valuable resource are the dedicated and talented people that walk through its doors everyday. Today the company continues to grow under the leadership of George’s sons: Richard, President, and George, Jr. as Vice President. Masters Machine Company still does business in Round Pond. It has a new and spacious manufacturing facility only a few miles from its original location. Their markets have expanded to include the automotive industry as well as the electronic, medical, and electrical fields. Parts produced by Masters reach far beyond U.S. shores and are shipped to many different parts of the world. 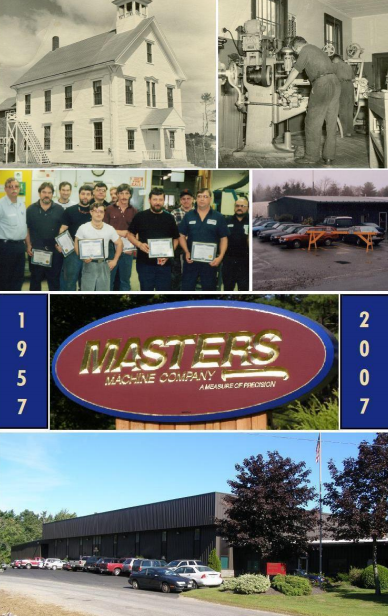 In 2007 Masters Machine Company celebrates its 50th year in business.